Life & Memories: I Have A Scrapbook Coach! I Have A Scrapbook Coach! Confession: When the Scrapbook Coach series first came out, I was a bit skeptical. Did I really need someone telling me how to put a layout together? But that was a hasty judgement on my part. This series encompasses much more than that. I really like larger layered photo mats. Must do this more often. I don't have to pick my background right away. I should try delaying a final decision until later in my process. By following Debbie's guidelines, but making my own specific choices, I ended up with a page in my own style. Consistency is important to me, so this makes me happy. According to Debbie, "the Scrapbook Coach video classes teach you to start with a common page foundation and then shake it up to make great looking scrapbook pages efficiently." After having gone through the process for myself, I'd say that is an excellent and accurate description. Currently there are four Scrapbook Coach classes in the series, with a new one due to come out very soon, maybe by the end of this week. There is a free 3-minute video explaining the series and a free video of one of the lessons right here. I would highly recommend not just watching the video, but actually scrapping a page. 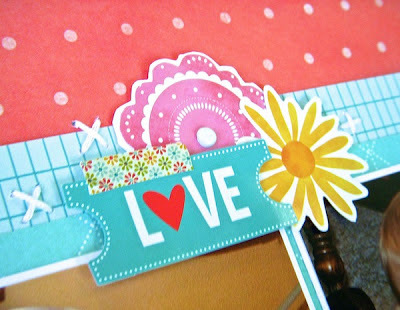 My skepticism is gone and I am hooked on the Scrapbook Coach classes! I think the Story Coach is going to be excellent too. A lot of fun! Great, bright page, Sue! I particularly like the title work. Your attention to detail really shows in the placement of letters, the heart and flower. It is just perfect! darling page and so glad that you've been pleasantly surprised by the class! Such a sweet page. I love the big triangles and layered mats. Soooo good! Love it! Beautiful colors! Having a coach works, what a fantastic page. Hmmm, I'm going to look into that! I love your layout! Fabulous job! What a cutie pie! I love that big photo mat idea, too! I love this...am off to check it out! Based on your past bunch of layouts, I've learned so much from you posting too. Definitely a fabulous page Sue! I always love to see how you use the class steps to create your pages and they are always beautiful! Super nice layout Sue! I love the stitching along the borders and really like how your photos are front and center! What are you talking about: you are a scrapbook coach. Love the bright crispness of this design. Love the color combo, so bright and fun! Lovely page! Great combination of patterns! 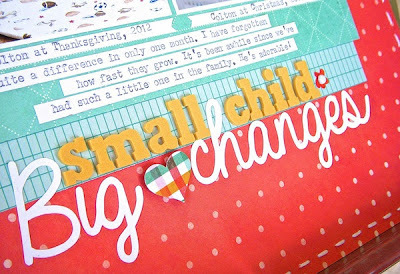 Fun page - lovely color scheme, bright and fun! Nice page; love the bright, cheerful colours. I enjoyed reading your class recommendations, too - always best to hear from someone who's taken a class before committing, IMO. Thanks for the recommendation. I am thinking about doing the coaching. I've never heard of the Scrapbooking Coach, but I'm going to check it out. Great layout! I had read about the Scrapbook coach but never saw it in action. Glad you came away with such useful information and a beautiful layout! On the Home Front: It's Summer!